Forespar's new quick-release Steering Control Arm extends functional range when behind the wheel. 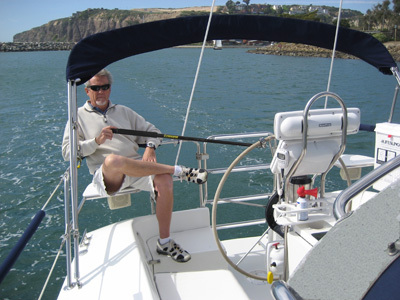 Made specifically for use while motoring or easy sailing, the control arm allows the driver to move away from the helm station and still control the steering. This extended range of movement has two specific benefits. 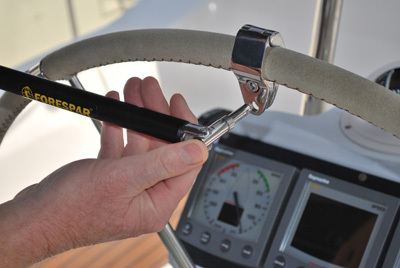 First, it enhances safety by allowing the helmsman to move outboard to the rail, increasing their forward sightline. This is especially helpful when trying to see around large headsails. Second, it allows for a number of new sitting positions for additional comfort. On many boats this means the driver can now safely relax on the tern rail seat. The Forespar Steering Control Arm uses a twist-lock extension with a special quick-release attachment clamp mounted to the wheel. It installs in seconds and can be easily deployed or removed with the simple push of a button.